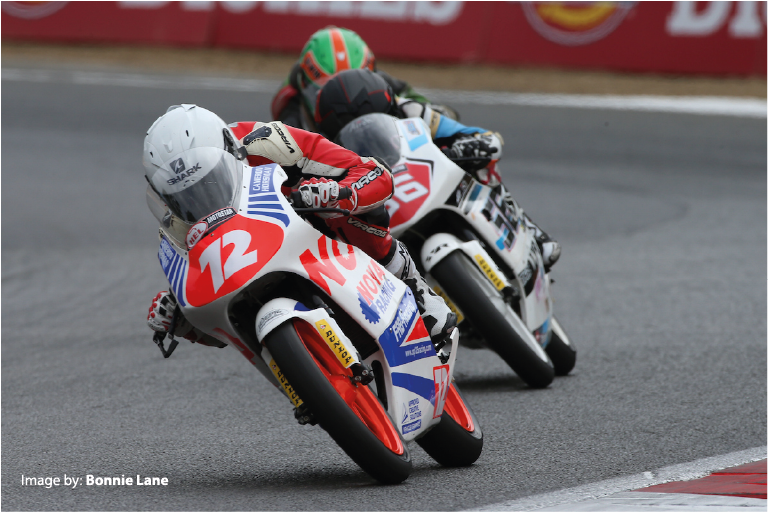 From the short 1.3 mile Scottish circuit of Knockhill, the Hel Performance British Motostar series moved to Cameron Horsman’s local track, the 2.4 mile Brands Hatch circuit, for round four. Cameron made a great start to the weekend on the Nova / Fab Racing Honda finishing second quickest in free practice one. A large amount of rain then fell. When the riders went out for free practice two the track was still damp. Horsman waited for the circuit conditions to improve before venturing out on slick tyres. No one was going to improve their lap times but the practice in mixed conditions could have proved valuable if the rain fell again later in the weekend. We have already seen this year, in the British Talent Cup that Horsman is talented even when the circuit is not at its best and he set the quickest time. For qualifying on Saturday the conditions were perfect. Dry track and warm weather. The lap times were the fastest they had been all weekend and Horsman improved his quickest lap time too. The session was really competitive and despite a time of 1:37.427 he would line up seventh in the standard category. He was around half a second off the rider in third. progress was halted and he was declared fifth. The second race took place on Sunday afternoon. This time it was it was a 14 lap 34-mile race and Horsman was feeling very positive. Again he got away well but his progress was made more difficult when he came across one of the slower riders on a GP category class machine. This faster machine was able to pull-away on the straight but was slowing him up through the corners. Try as he might he was unable to pass and make it stick. He went on to cross the line in a slightly frustrated 6 th place. Having added 21 points over the weekend Horsman remains sixth overall but is now just four points behind the rider in fifth. Cameron Horsman said,” In qualifying I was expecting to do a lot better after the Friday but I didn’t manage to get a good enough lap in. A few people were trying to get a tow and were getting in my way a bit. In race one the front three got away but I was in the second group and we managed to catch them up. Then there was a crash and that messed it up a bit. In the second race I was third on the grid but I had a bad first lap and got stuck behind a GP class bike. I just couldn’t overtake so it was frustrating. I managed to keep the other standard class riders in our group behind me though.